Getting children active is becoming more and more important in today’s society. With the rise in childhood obesity it is essential to get young people to participate in sport and athletics. Schools across the UK should certainly consider getting sports and athletics facilities installed in order to improve the physical activity levels in children and help prevent childhood obesity and various other fitness problems. Having these facilities can also give students more opportunities in life and get them involved in more clubs helping to improve various skills. Improving physical activity in schools is one of the most important things to prevent health problems for the kids in the future. 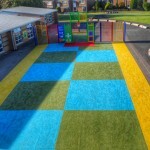 If you are a school in the United Kingdom and you are thinking about getting a sports facility or athletics area installed, make sure to have a read of this article. We have carried out research to find out about health and activity levels in young people and there is plenty you can be doing to help improve student’s participation in such activity. You can also get in touch with us to find out more about the various products we offer to help schools with improving sports provision and physical activities. Just use the contact box to let us know what you are looking for and we’ll reply back as soon as we can. Through a piece of text that has been recently produced via UKactive Kids, it pointed out the problems youngsters could have with regards to inactivity. By ensuring that activity is managed more effectively it might help reduce stress for UK health organisations. The organisation Generation Inactive has utilised this specific report to investigate young people’s overall health levels within educational facilities. It’s important to get at least one hour of physical exercise each day. Today’s era of kids has become called the most inactive in history. It is a fear that youngsters might have a smaller lifetime compared to their mother and father. Children and adults who have very low health levels could be adding to weight problems. The National Health Service is at present spending billions of pounds because of the unhealthy weight statistics. Young people’s Body Mass Index (BMI) is recorded in Primary Schools through the National Child Weight Measurement Programme. When raising fitness throughout schools, it shouldn’t depend solely on the Body Mass Index measurements. The reason being that you can have a healthy body mass index but still be unfit, which can result in far more health problems as opposed to being obese but physically fit. As the BMI data cannot declare if a young person is healthy, it has been advised that the UK authorities look for more different options to measure results, including strong heart and physical fitness levels. When trying to obtain information, these processes need to be entertaining for children to make sure they don’t feel uncomfortable. Poor physical activity levels can lead to health problems in maturity, which can charge the National Health Service additional money. It’s recommended by a few groups that more should be done to evaluate the amount of activity youngsters are involved with in and out of school. UKactive Kids analysed the information findings from educational facilities throughout England. The outcomes revealed that none of the specified schools calculated children’s cardiovascular health. Fewer than 50% of schools monitored their own students’ activity levels during PE classes. Improving physical activity in schools is more important than ever and having better equipment and sports areas can greatly benefit the students. By having better resources and facilities for PE lessons, you are able to assess the children’s health more effectively and you can also make the kids more enthusiastic about fitness and health. Since childhood obesity and lack of physical activity is becoming a big problem within the UK in recent years, it is highly recommended to offer students the best opportunities to help them improve their physical exercise. The British government have agreed to offer £150 million each year to improve physical exercise in academic institutions. This is going to be attained with a support scheme, Physical education along with Sports Premium. This lets Head Teachers to fund game physical activities as part of their educational institutions. Funds has recently happened to be made use of to help update facilities, benefit from specialist sport teachers and then for new Physical education equipment. Educational facilities used this kind of funding to improve the standards of educating as well as include higher quality gym equipment. Ofsted have observed developments through the financing, because the schools now have associates with fitness groups in the bigger neighbourhood. It’s not just the increase in physical activity which the government has tried to do to reduce childhood obesity. The Sugar Tax is another attempt to combat the levels of obesity within children. This was created to put a tax on sugary sweets and drinks in order to prevent children from buying these items. The extra money created by people buying these will then be put towards creating new sports and athletics facilities for children or improving existing ones, therefore helping to increase their participation in physical exercise. There are a number of things which can be installed to help increase children’s participation in sports and exercise at schools that can be finded by the Sugar Tax. 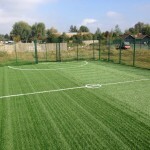 Schools could have new sports courts installed including MUGA (multi use games areas). 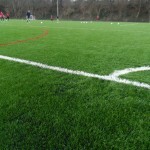 These allow for a number of sports to be played in a single space. This means there will be a lot more variety and choice for the children so P.E. lessons aren’t considered ‘boring’ for the kids. 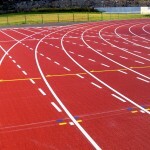 It’s not just sports pitches which can be installed due to the Sugar Tax; athletics facilities may also be constructed. 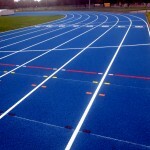 These may vary from long jump, high jump fans and running tracks. 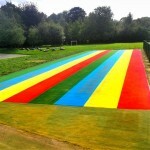 Multisport areas may also be constructed for athletics too, which allows for various activities to be carried out – these are otherwise known as compact athletics facilities and are becoming more and more popular in schools throughout the United Kingdom. The assessments now have pointed out that very low exercise levels have the ability to badly impact individuals’ life styles. Head-teachers are now recommended for a whole day fitness approach and not just in PE classes. Morning and dinner groups may help accomplish enhanced physical fitness stages in kids plus enjoying PE within the day rather than almost all being educative classes. Children find PE tuition scary, because of this even more should be done to improve that and as well improve proactive playground playtime. As a result of allowing young children to be able to increase their health and well-being within dinner teams, it’s more prone to lead to an active standard of living into adulthood. The reports discovered that insufficient time is carried out minimize the risk of health conditions that include being diabetic and also cardiovascular disease; this is why it is important to make sure your school has a number of facilities to make certain your pupils have the best opportunities and are not being subject to health issues. There is plenty for you to do to help improve activity levels for children in your school. If you are interested in getting a new sports court installed or a compact athletics facility, please do not hesitate to get in touch with our team using the enquiry form provided on our website. If you have a smaller budget available, our team can improve your existing facilities or create smaller areas to suit your needs and requirements, so please contact us now and help to start improving physical activity in schools. We’d be happy to offer advice on what you can do and the type of facilities you could install to help with improving children’s activity levels during school.